This article is about deep pit, underground mining. For surface mining, see Open-pit coal mining in the United Kingdom. Coal mining in the United Kingdom dates back to Roman times and occurred in many different parts of the country. 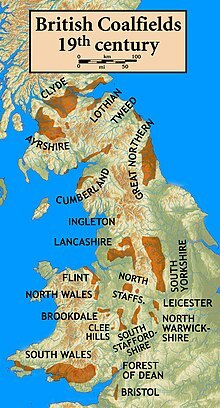 Britain's coalfields are associated with Northumberland and Durham, North and South Wales, Yorkshire, the Scottish Central Belt, Lancashire, Cumbria, the East and West Midlands and Kent. After 1970, coal mining quickly collapsed and practically disappeared in the 21st century. The consumption of coal – mostly for electricity – fell from 157 million tonnes in 1970 to 18 million tonnes in 2016. Of the coal mined, 77% of supplies were imported from Colombia, Russia and the United States. Of the coal mined in the UK in 2016 all was from open-cast coal mines. Employment in coal mines fell from a peak of 1,191,000 in 1920 to 695,000 in 1956, 247,000 in 1976, 44,000 in 1993, and to 2,000 in 2015. Almost all onshore coal resources in the UK occur in rocks of the Carboniferous age, some of which extend under the North Sea. Bituminous coal is present in most of Britain's coalfields and is 86% to 88% carbon. In Northern Ireland, there are extensive deposits of lignite which is less energy-dense based on oxidation (combustion) at ordinary combustion temperatures (i.e. for the oxidation of carbon - see fossil fuels). The last deep coal mine in the UK closed on 18 December 2015. Twenty-six open cast mines still remain open  and Banks Mining said in 2018 they planned to start mining a new site in County Durham. The United Kingdom's onshore coal resources occur in rocks of the Carboniferous age, some of which extend under the North Sea. The carbon content of the bituminous coal present in most of the coalfields is 86% to 88%. Britain's coalfields are associated with Northumberland and Durham, North and South Wales, Yorkshire, the Scottish Central Belt, Lancashire, Cumbria, the East and West Midlands and Kent. Stone and Bronze Age flint axes have been discovered embedded in coal, showing that it was mined in Britain before the Roman invasion. Early miners first extracted coal already exposed on the surface and then followed the seams underground. It is probable that the Romans used outcropping coal when working iron or burning lime for building purposes. Evidence to support these theories comes mostly from ash discovered at excavations of Roman sites. There is no mention of coal mining in the Domesday Book of 1086 although lead and iron mines are recorded. In the 13th century there are records of coal digging in Durham and Northumberland, Nottinghamshire and Derbyshire, Staffordshire, Lancashire, the Forest of Dean and North and South Wales. At this time coal was referred to as sea cole, a reference to coal washed ashore on the north east coast of England from either the cliffs or undersea outcrops. As the supply of coal on the surface became used up, settlers followed the seam inland by digging up the shore. Generally the seam continued underground, encouraging the settlers to dig to find coal, the precursor to modern operations. The early mines would have been drift mines or adits where coal seams outcropped or by shallow bell pits where coal was close to the surface. Shafts lined with tree trunks and branches have been found in Lancashire in workings dating from early 17th century and by 1750 brick lined shafts to 150 foot depth were common. Annual UK coal production (in red) and imports (black), DECC data. Coal production increased dramatically in the 19th century as the Industrial Revolution gathered pace, as a fuel for steam engines such as the Newcomen engine, and later, the Watt steam engine. To produce firewood in the 1860s equivalent in energy terms to domestic consumption of coal would have required 25 million acres of land per year, nearly the entire farmland area of England (26 m. acres). A key development was the invention at Coalbrookdale in the early 18th century of coke which could be used to make pig iron in the blast furnace. The development of the steam locomotive by Trevithick early in the 19th century gave added impetus, and coal consumption grew rapidly as the railway network expanded through the Victorian period. Coal was widely used for domestic heating owing to its low cost and widespread availability. The manufacture of coke also provided coal gas, which could be used for heating and lighting. Most of the workers were children and men. A mining business owner, Jordan Geoff of Upton colliery, West Yorkshire was prosecuted in 1927 for manslaughter for inhumane treatment of his workforce. In the 1950s and 1960s, around a hundred North East coal mines were closed. In March 1968, the last pit in the Black Country closed and pit closures were a regular occurrence in many other areas. Beginning with wildcat action in 1969, the National Union of Mineworkers became increasingly militant, and was successful in gaining increased wages in their strikes in 1972 and 1974. Closures were less common in the 1970s, and new investments were made in sites such as the Selby Coalfield. In early 1984, the Conservative government of Margaret Thatcher announced plans to close 20 coal pits which led to the year-long miners' strike which ended in March 1985. The strike was unsuccessful in stopping the closures and led to an end to the closed shop in British Coal, as the breakaway Union of Democratic Mineworkers was formed by miners who objected to the NUM's handling of the strike. Numerous pit closures followed, and in August 1989 coal mining ended in the Kent coalfield. After modernisation of underground mining, a deep shaft mine could produce 700 million tonnes annually. In 1986, Kellingley colliery achieved 404,000 tonnes in a single shift but nevertheless, since 1981 production fell sharply from 128 to 17.8 million tonnes in 2009. Between 1947 and 1994, some 950 mines were closed by UK governments. Clement Attlee’s Labour government closed 101 pits from 1947-‘51, Macmillan (Conservative) closed 246 pits from 1957-‘63, Wilson (Labour) closed 253 between 1964-’77, Thatcher (Conservative) closed 115 between 1979-'90. In 1994, Prime Minister John Major privatised British Coal after announcing 55  further closures, with the majority of operations transferred to the new company UK Coal. Nevertheless, by this time British Coal had closed all but the most economical of coal pits. The pit closures caused coal production to slump to the lowest rate in more than a century, further declining towards the end of the 1980s and into the 1990s. This coincided with initiatives for cleaner energy generation as power stations switched to gas and biomass. A total of 100 million tons was produced in 1986, but by 1995 the amount was around 50 million tons. The last deep mine in South Wales closed when the coal was exhausted in January 2008. The mine was closed by British Coal in the privatisation of the industry fourteen years earlier and re-opened after being bought by the miners who had worked at the pit. Following the limitations to the National Union of Mineworkers' power, British coal-dependent industries have turned to cheaper imported coal. In 2001, production was exceeded by imports for the first time. In 2014, coal imported was three times more than the coal mined in Britain, despite large resources in the country. In 2009, companies were licensed to extract 125 million tonnes of coal in operating underground mines and 42 million tonnes at opencast locations. Coal mining employed 4,000 workers at 30 locations in 2013, extracting 13 million tonnes of coal. The three deep-pit mines were Hatfield and Kellingley Collieries in Yorkshire and Thoresby in Nottinghamshire. There were 26 opencast sites in 2014, mainly in Scotland. British coal mines achieve the most economically produced coal in Europe, with a level of productivity of 3,200 tonnes per man year. Most coal is used for electricity generation and steel-making, but its use to heat homes has decreased because of pollution concerns. The commodity is also used for fertilisers, chemicals, plastics, medicines and road surfaces. Hatfield Colliery closed in June 2015, as did Thoresby, and in December 2015, Kellingley, bringing to an end deep coal mining in the UK. On 20 December, thousands of people turned out for a march in Yorkshire to mark the occasion. The march began in Knottingley and finished with a rally and party at Kellingley Miners Welfare club. The demand for coal is likely to fall with increasing focus on renewable energy or low-carbon sources and loss of industry due to globalisation. Oil and gas reserves are predicted to run out long before coal, so gas could be produced from coal by gasification. On 21 April 2017, Britain went a full day without using coal power to generate electricity for the first time since the Industrial Revolution, according to the National Grid. In April 2018, a new record was set of 55 hours without coal, which in turn was broken by a period of more than 72 hours without coal a few days later. ^ "Digest of UK Energy Statistics (DUKES): solid fuels and derived gases - GOV.UK". www.gov.uk. Retrieved 2018-01-17. ^ a b c "Mineral Profile - Coal". bgs.ac.uk. British Geological Society. March 2010. Retrieved 7 July 2015. ^ a b "Surface Coal Mining Statistics". www.bgs.ac.uk. 2014. Retrieved 2015-07-07. ^ "Banks Mining looking to operate Bradley surface mine in County Durham :: Banks Group". www.banksgroup.co.uk. Retrieved 2018-01-17. ^ Survey, British. "Coal | Mines & quarries | MineralsUK". www.bgs.ac.uk. Retrieved 7 July 2015. ^ "Types and uses of coal". www.ukcoal.com. UK Coal. Retrieved 8 July 2015. ^ a b "Mining through the ages". ukcoal.com. UK Coal. Retrieved 8 July 2015. ^ Clark, Gregory; Jacks, David (April 2006). "Coal and the Industrial Revolution, 1700-1869" (PDF). European Review of Economic History (April 2007 (Volume 11, Issue 1 )). doi:10.1017/S1361491606001870. Retrieved 8 July 2015. ^ "Energy Trends: September 2014, special feature articles - Coal in 2013 - Publications - GOV.UK". www.gov.uk. 25 September 2014. Retrieved 2015-07-07. ^ "Coal Mining in North East England". www.englandsnortheast.co.uk. Retrieved 2015-07-07. ^ Pearson, Mick. "The Closing Of Baggeridge Colliery (from "We Were There" Blackcountryman Volume 1, Issue 3)". blackcountrysociety.co.uk/. Black Country Society. Retrieved 8 July 2015. ^ Routledge, Paul (1994). Scargill: the unauthorised biography. London: Harper Collins. pp. 59–79. ISBN 0-00-638077-8. ^ "1984: Miners strike over threatened pit closures". BBC News. 1984-03-12. ^ Elmhirst, Sophie (22 June 2011). "After the coal rush". newstatesman.com. New Statesman. Retrieved 8 July 2015. ^ "Colliery Closures Since 1947". ^ "Leading Article: John Major: Is he up to the job?". The Independent. London. 1993-04-04. ^ "BBC Wales - History - The Miners' Strike". BBC Wales. BBC. 15 August 2008. Retrieved 8 July 2015. ^ a b "UK Coal: Coal In Britain Today". UK Coal (Archived). Archived from the original on 2012-04-14. Retrieved 8 July 2015. ^ "Coal mine closes with celebration". BBC News. 2008-01-25. ^ John F. Burnes (April 16, 2013). "Whitwell Journal: As Thatcher Goes to Rest, Miners Feel No Less Bitter". The New York Times. Retrieved April 17, 2013. ^ a b "Historical coal data: coal production, availability and consumption 1853 to 2013 - Statistical data sets - GOV.UK". www.gov.uk. Department of Energy & Climate Change. 22 January 2013. Retrieved 2015-07-07. ^ "Thousands march through Yorkshire to mark end of deep coal mining at Kellingley - BBC News". Bbc.co.uk. 20 December 2015. Retrieved 20 December 2015. ^ "World Reserves of Fossil Fuels". ^ "UK COAL : Britain's largest coal mining company - Coal Today and for Tomorrow". UK Coal. 2012-01-26. Archived from the original on 2012-01-26. Retrieved 2015-07-08. ^ "First coal-free day in Britain since Industrial Revolution". BBC News. 22 April 2017. Retrieved 22 April 2017. ^ "UK runs without coal power for three days in a row". Ashton, T. S. & Sykes, J. The coal industry of the eighteenth century. 1929. Baylies, Carolyn. The History of the Yorkshire Miners, 1881-1918 Routledge (1993). Benson, John. "Coalmining" in Chris Wrigley, ed. A History of British industrial relations, 1875-1914 (Univ of Massachusetts Press, 1982), pp 187–208. Dron, Robert W. The economics of coal mining (1928). Fine, B. The Coal Question: Political Economy and Industrial Change from the Nineteenth Century to the Present Day (1990). Griffin, A. R. The British coalmining industry: retrospect and prospect. 1977. Michael W. Flinn, and David Stoker. History of the British Coal Industry: Volume 2. 1700-1830: The Industrial Revolution (1984). Heinemann, Margot. Britain's coal: A study of the mining crisis (1944). Hill, Alan. Coal - a Chronology for Britain. : 2012: Northern Mine Research Society. Hull, Edward (1861). The coal-fields of Great Britain: their history, structure, and resources. London: 1861: Stanford. Hull, Edward. Our coal resources at the close of the nineteenth century (1897) Online at Open Library. Stress on geology. Jaffe, James Alan. The Struggle for Market Power: Industrial Relations in the British Coal Industry, 1800-1840 (2003). Jevons, W. Stanley. The Coal Question: An Inquiry Concerning the Progress of the Nation, and the Probable Exhaustion of Our Coal Mines (1865). Kirby, M.W. The British coalmining industry, 1870-1946: a political and economic history. 1977. Lewis, B. Coal mining in the eighteenth and nineteenth centuries. Longman, 1971. Rowe, J.W.F. Wages In the coal industry (1923). Williams, Chris. Capitalism, community and conflict: The south Wales coalfield, 1898-1947 (U of Wales Press, 1998). Video and commentary on the Gateside Colliery bing, Sanquhar.